Aside from adding signature flavor to many of your favorite dishes, herbs offer a wealth of potential health benefits. Many herbs contain high levels of vitamins, minerals and antioxidants. Herbs also contain phytochemicals that help prevent and treat many common health conditions. If you seek to restore proper pH balance, adding certain herbs to your diet or supplementation regimen may be a useful place to start. Consult your doctor before using herbs to treat a medical condition. Most herbs and spices are alkalizing, writes naturopath and accupuncturist Michelle Schoffro Cook, D.N.M., D.Ac., author of the book "The Ultimate PH Solution: Balance Your Body Chemistry to Prevent Disease and Lose Weight." 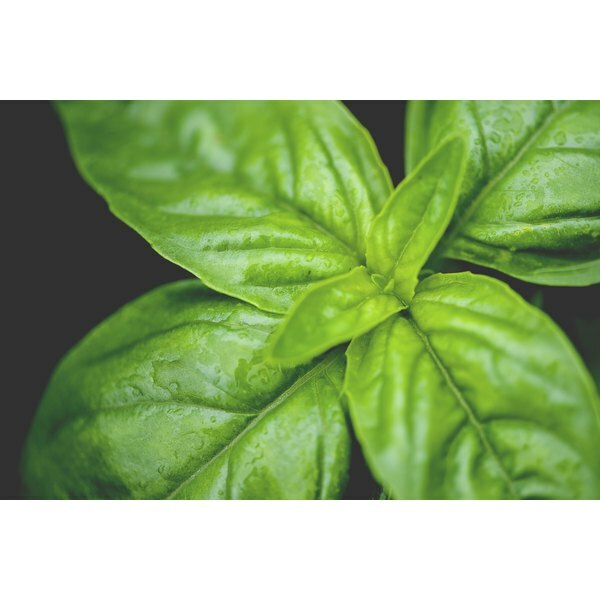 Garlic, ginger, basil, cilantro oregano and rosemary, staples in many modern home kitchens and gardens, can add a flavor-packed alkalizing boost to your favorite foods and recipes. Cook also recommends replacing acid-forming coffee and tea with herbal teas to double the alkalizing effect of herbs. A blend of dandelion root, burdock root, yellow dock root and skullcap or valerian root has alkalizing effects that are particularly effective for vascular headaches, advises herbalist Rosemary Gladstar in her book "Rosemary Gladstar's Herbal Recipes for Vibrant Health: 175 Teas, Tonics, Oils, Salves, Tinctures and Other Natural Remedies for the Entire Family." Use a ratio of three parts dandelion, two parts burdock and one part yellow dock and drink 1/4 cup with 1/4 tsp. of skullcap or valerian every 30 minutes until your headache subsides. Aloe vera juice restores pH balance, calms inflammation, provides antioxidants and has a mild laxative effect, says registered nurse and naturopath Roni Deluz, R.N., N.D., Ph.D., author of the book "21 Pounds in 21 Days: The Martha's Vineyard Diet Detox." A number of other herbs are useful for cleaning the colon, liver and kidneys and alkalizing your system. Cayenne, ginger, dandelion, alfalfa, black cohosh, burdock cascara sagrada, psyllium, beet fiber, oat bran, apple pectin, rice fiber fennel seed and slippery elm bark all provide these benefits. Herbs high in mineral content may help restore pH balance and reduce the need for your body to expend its mineral reserves, particularly calcium, to offset the effects of a high acid diet. Some high-mineral content herbs include nettles, oat straw, red raspberry leaves, chamomile, horsetail and dandelion greens, according to the "Women's Encyclopedia of Natural Medicine: Alternative Therapies and Integrative Medicine," by naturopath Tori Hudson. Other herbs with particularly alkalizing effects include chili pepper, cinnamon, curry, mustard and tamari.